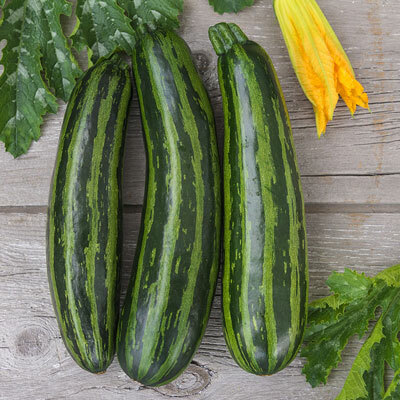 Green Tiger Hybrid Summer Squash | Henry Field's Seed & Nursery Co.
A staff trial favorite, Green Tiger's delicious fruit has a pleasantly mild, nutty flavor. With a great resistance to powdery mold and upright, open habit, this summer squash is easy to pick and produces strong yields of glossy smooth, dark and medium green-striped summer squash with the perfect amount of speckling--a true garden beauty!. 55 DAYS. Soil Requirements: Fertile, loose, well-drained soil, rich in organic matter. Fruit: Cylindrical fruit, up to 8 inches long, with bold, dark and medium green stripes, and some speckling.